BAseball Reality Tour: Who Are These Guys? 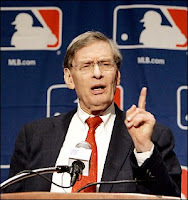 Bud Selig is such a bad public speaker. He's such an old curmudgeon, and he comes off as an absolute dinosaur who's never cared for anything that doesn't come from Wisconsin. Anyway, he handles the announcement of the picks about as well as any random senior citizen off the street could. The draft starts with Bud and all of Major League baseball giving themselves a big pat on the back for starting up a TV network. Yippee. How hard is it to start up a TV network? Weird Al saved a fledgling TV station in the admittedly fictional UHF, but still they had no money. With the first pick, the Nationals do what everyone except Mike Wilbon would do, and that's draft Stephen Strasburg with the first pick. I'd like to see him sign early and pitch for the Nationals as soon as possible. I'd like to see him become an exciting strikeout pitcher that is a joy to watch, like Lincecum and King Felix. That being said, I'd probably in some sick way enjoy it if he becomes Ryan Leaf and has comedic moments yelling at beat reporters to stop asking him questions and to just leave him alone. I mean he's going to make dozens of millions of dollars before he even puts on a professional uniform, so I'm not going to feel bad if he turns into Homer Bailey. The second pick goes to the player labeled the best hitter in the draft: Dustin Ackley, to the Seattle Mariners. He's an outfielder at the University of North Carolina. They're still in the College World Series, but this guy is very soon going to get about six million dollars to move to whatever minor league bumble funk town the Mariners choose. Donovan Tate went #3 to the Padres. They're saying it's going to take some cash to get this guy away from a football scholarship. He's an athlete, his dad was a pro athlete, and Kevin Towers is hoping to sign this guy and bring some offense to that awful hitters' park. This draft is heavy in pitchers, yet the second, third, and fourth picks are all hitters. At #4, the Pittsburgh Pirates selected Boston College's catcher, Tony Sanchez. Tony is originally from Miami and comes in with tremendous scouting reports across the boards. He's not Matt Wieters, but the Pirates would be happy with a guy who could play like Ryan Doumit and stay healthy. Yesterday, I alluded to my anticipation for whom the Orioles would take. I have a lot of confidence in Andy MacPhail and think the foundation that the Orioles already have in place is something to be extremely optimistic about. I've been thinking they'll take a good pitcher, but have no idea who to suggest. From what I understand most of the guys in the draft could go anywhere from #5 to #40, so why would I remotely care about anyone's mock draft opinions? Tyler Matzek sounds conceited, greedy, and obnoxious, but he might be really good. Well, the Orioles would up taking Matt Hobgood, a RHP out of high school in Norco, CA. According, to Norco's website, it is also "Horsetown USA". From what the guys on TV are saying, Hobgood sounds like a solid bet to be successful. Really, everyone in the top 6 sounds good, which is funny because probably only about 3 or 4 of them will work out. At #6, the San Francisco Giants selected Zach Wheeler. He's a high school pitcher out of Georgia, we've been hearing about for a while. So, the TV guys: Harold Reynolds, John Hart, the somewhat anonymous host, and some guy who's big into scouting, haven't said anything bad about any of the Top 6 picks. At #7, the Atlanta Braves took a LHP from Vanderbilt named Mike Minor. Reynolds and Hart are saying nice things about him, but he doesn't look very imposing on camera. He certainly doesn't make anyone mention a comparison to David Price. Cincinnati selected our nomination for first potential bust. With the 8th pick, they took a pitcher from Arizona State, Mike Leake, who got a few backhanded complements, setting off red flags in my head. According to Harold Reynolds, "[Leake] is not gonna be a guy who strikes a lot of people out." John Hart added, "He is a little bit undersized." and "He's not going to be a #1 starter." After all that, Reynolds said, "he will battle in a big game." Terrific. What a joke. Later in the draft, Leake was interviewed over the phone, and he admitted he didn't think he'd go that high. At #9, the Tigers took Jacob Turner, a high-school "strikeout machine". He throws 94-95 with an easy delivery, for 5 or 6 innings. 6'5" - 210 lbs. I thought it would be great for the Tigers to team up Tyler Matzek ("the lefty Rick Porcello") with the real Rick Porcello. All signs point towards this being a very good pick, so I think Turner and Porcello should be good wingmen for Justin Verlander in the next couple of years. The Nationals are also picking 10th, because they picked Aaron Crow at #9 last year but failed to sign him. This year, Aaron Crow & Tyler Matzek are still available. If the Nats are going to spend $20 to $30 million on Strasburg, why shouldn't they just go all out and get another "expensive" kid who's going to cost "only" $7 to $8 million? Well, they took Drew Storen, a RHP from Stanford. He's "a decorated college pitcher". He's a 2-pitch guy with a plus fastball/plus slider. He's a relief pitcher, and he could be in The Show in a hurry. Tyler Matzek finally went 11th to the Rockies. He's 18 years old, 6'3" - 185 lbs, left-handed, and he mixes four pitches. The host said he keeps reading "that he's such a good kid." Really? Then, why is he saying he wants "unprecedented" money? Why is he saying that he doesn't just want to match the record bonuses of Josh Beckett and Rick Porcello, but he wants to exceed it? Because he's such a good kid? I don't buy it. That being said, this should be a good pick for Colorado because they need to draft pitchers. Free Agent pitchers will not go there, so they need to draft arms and sign free agent bats. At least, that's the theory. With the 12th pick, the Kansas City Royals took Aaron Crow. So, I guess in a year or two, we could see a Royals rotation with Greinke, Meche, Hochevar, and Crow. Now what will they do about that team OBP? The always exciting Oakland A's took Grant Green, a shortstop from USC. He was the highest rated hitter available, and we know the A's like college kids who are easier to project statistically. The broadcast showed him as a 5-tool player, but he's only rated at above average, or good, in his tools. Nothing spectacular, but he should be a good player who can play solid defense, get on base, and maybe pop 10 to 20 homeruns per year. Nolan Ryan took another tall left-handed pitcher with the 14th pick. He's just a high-school player, so he's young and risky to project. The scouts say he has a great delivery and throws hard, though, so maybe he can be something special. Like Colorado, the Rangers really need to keep drafting arms like Derek Holland and Neftali Feliz because stud free agent pitchers aren't going to sign there unless they're coming off surgery, like Ben Sheets. Cleveland took a hard throwing right hander from UNC Chapel Hill, Alex White, at 15th. He could be another guy that can be in the bullpen in a hurry. There's pressure on UNC to do well in the College World Series, with the #2 and #15 picks on the team. Later in the draft, Alex and his teammate, Dustin Ackley, were interviewed on camera. They seemed poised, humble, and excited. Tyler Matzek was interviewed after the 15th pick, and he looked and sounded like a complete dufus. Maybe we should give him a break for being 18 years old and really nervous. Still, he was acting like a complete tool, in his ESPNZone t-shirt. Plus, all the other players who were interviewed seemed much sharper. Some of them were a little slow, or goofy, but Matzek was the worst. From the audience's perspective, the draft has deteriorated into a complete and utter crapshoot. I'm sure there are guys in the game who have a good idea who's going to be slected in the next 5 to 10 picks, but jeeze there is no reason for even an above average fan to have any idea what's going on or who's available. The D'backs had back-to-back picks at 16 and 17. They took two hitters. The first is a switch-hitting high school third baseman, Bobby Borchering. The second pick is actually someone I heard of: Notre Dame outfielder A.J. Pollock. The Marlins took Chad James, LHP from high school in Yukon, Oklahoma. Forgive me for knowing nothing about someone from Yukon, Oklahoma. I've never even heard of Yukon, Oklahoma, but it sounds terrible. What is the first thing you see on Yukon, Oklahoma's website? "Home of Garth Brooks". The Cardinals took Shelby Miller, a high school RHP from Texas. Everyone on TV is saying glowing things about him. He's a fireballer from Texas, great body, yada yada yada. That stinks. The Cardinals don't look like they are going away anytime soon. Toronto took a college pitcher, Chad Jenkins, who's supposed to be good. He's big, strong, durable. Power sinker, power slider guy, who's built for innings. John Hart thinks it's a great pick. He's not long and lean, but he looks like a horse with a great work ethic. 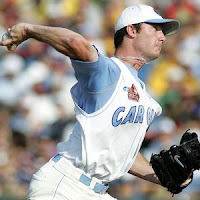 If this guy and Matt Hobgood become even good #3 starters, the Blue Jays and Orioles can really make some noise at the Yanks/Sox/Rays party in 2011. Jiovanni Mier is an 18 year old shortstop, and he was just selected 21st overall by the Houston Astros. John Hart thinks he will eventually be a plus defensive shortstop who can hit a little. Boooooring. The Twins took Kyle Gibson, Univ of Missouri. He had a stress fracture late in his season, and he won't be able to pitch until late July. If he hadn't gotten hurt, he probably would have been picked in the Top 5 picks. Since it's just a stress fracture in his wrist, I think it's a great pick. He didn't hurt his elbow or his shoulder, so he should be able to heal and be good again. This could be the steal of the draft. Good for the Twins. The White Sox too an OF from LSU, Jared Mitchell. He plays football at LSU, as a Wide Receiver. He can run, he can hit. He currently plays Centerfield. Great athlete; that's all they keep saying on TV. 24 and 25 go to the Angels. At #24, they took a high school left fielder from Texas named Randal Grichuk. This was a bit of a "surprise" to the hosts. Whatever, they have two picks and probably about twenty guys who seem like feasible picks. At #25, they took Michael Trout, a center fielder from Millville, NJ, who comically is the only player to show up to the draft. There is no way any of the hosts are going to criticize this pick in front of this kid. Unbelievable. MLB invited every potential pick, and only one kid decided to take them up on it. The Brewers took a RHP from Indiana University, Eric Arnett. 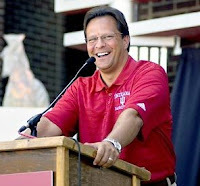 He's 6'5" 225 lbs, and he was athletic enough to practice with Tom Crean's basketball team. Relatedly, IU basketball is so bad right now that they need baseball players for the practice squad. The Mariners took a high school shortstop from Florida, but this one's not Alex Rodriguez. This is Nick Franklin; he's a switch hitter. They drafted Dustin Ackley at #2 overall, maybe these guys will help in a couple of years. The Red Sox and Yankees are picking next. I have a lot more faith in the Red Sox front office. Did you see Daniel Bard retire the side against the Yankees last night? His stuff was electric, with an easy, moving fastball at 98 to 100 mph. The Red Sox took a Puerto Rican high school outfielder named Reymond Fuentes. He has explosive speed and can hit. Yankees at #29 selected a left-handed high school outfielder, Slade Heathcott. He has 5 tools, some shady "off the field issues", and he's from Texarkana, Texas. Tampa at #30 will hopefully not take the guy the Cubs want. I don't even remember the last time the Cubs had a good #1 pick, besides Mark Prior. And, he didn't really reverse any curses on the Northside, either. The Cubbies had such a "successful" season that they are picking 31st. Can't you get a supplemental top 10 pick every year if your championship drought is over 100 years? Leave it to the MLB Network to let their own timed (!) event run long, so my DVR didn't even get through Tampa's pick. As I check the internet, I see that the Rays took a high school outfielder named Levon Washington. I thought he was a running back on the Jets. The Cubs selected University of California Outfielder Brett Jackson. He was a leadoff hitter and center fielder at Cal. According to Cubs.com, he's a left-handed hitter with above average speed. Is it too much to ask the Cubs to draft a center fielder with tremendous speed instead of above average speed? I don't have a better idea of whom they should have taken, but I just don't like the sound of this Brett Jackson character. Prove me wrong, kid. Prove me wrong.